Belkin is one of the leading Small Office Networking devices manufacturers. In this tutorial, we can see a direct method to configure their Wireless Routers by accessing the web-based setup page without using the setup disc. Though Easy Setup reduces our time to configure a device, to make custom changes, it is better to do manual configuration. The manual setup gives more freedom to make custom changes in settings. There are many models of wireless routers like N150, N300, N600DB, N750DB etc. Though there are many product models, you can use the same procedure to set up any model. 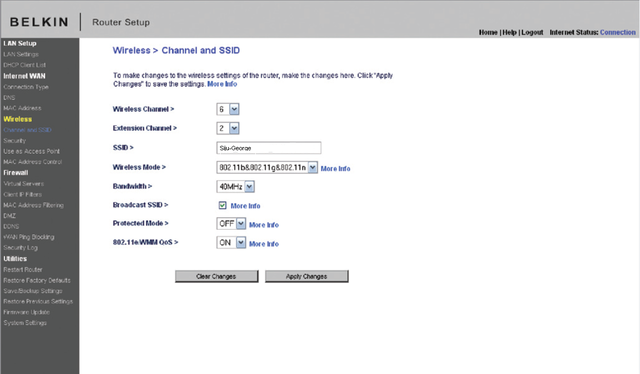 This is the first step in configuring the device on your network. Connect devices as per the order provided below. By default, there is no password set and you just simply click submit button to log on to the setup page. 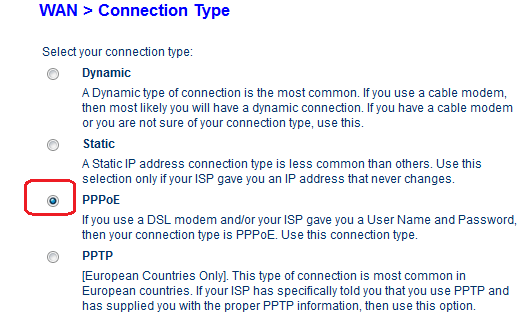 Click on Connection Type under Internet WAN and select the Internet connection you have from your ISP. If you have Cable Internet connection, you should select Dynamic option and click next. In most cases, you may need to type the hostname provided by Cable Internet Service Provider. In addition to this, to work with the cable modem, you may need to clone the MAC address of your computer using the link/button Change WAN MAC Address. Use the clone button to copy MAC address of your computer. Click Apply Changes after entering the details. After having this step, Belkin will be ready to work with your cable internet connection. This step is important because your Internet Service Provider recognizes registered users using the MAC address of the PC used while activating the connection. 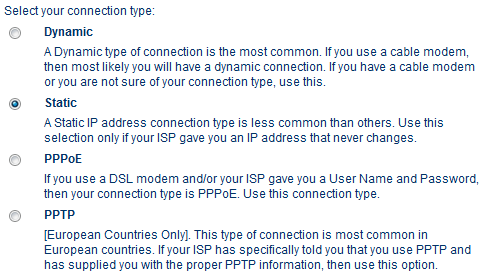 If you use a different PC, your ISP will not allow it to access the Internet because of non registered MAC address. By MAC address cloning feature we can override this restriction. Enter the Username and password provided by your DSL Internet Service provider. Here you should enter the user name and password provided by your Internet Service Provider. After entering the details you should click on save settings. Now your Belkin router is configured in PPPoE for DSL broadband connections. If you do not configure in PPPoE(means in bridge mode), you may need to enter username and password (provided by ISP) on your PC whenever you access the Internet. Also, you will not be able to share the broadband connection in this bridge mode. To edit the wireless settings, click on Wireless tab in the setup page. You can edit the Wireless network name and wireless channel here. Here I have customized certain WiFi settings with personalized information. Wireless name (SSID) is the name of your wireless network. The most recommended wireless channel is 6. You can use channel 1 and 11 too. Here I use my name as the SSID by removing the default name. It is important to change the default SSID to easily identify your network. To enable WiFi security, click on security under the wireless tab and follow the instructions in the link below. It is very important that you should update firmware after configuring the router. To know how to update the firmware click on the link below. 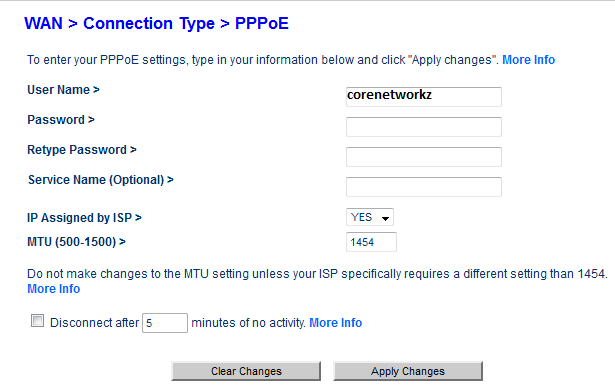 You can change the router IP address and you can enable or disable the DHCP function using this window. 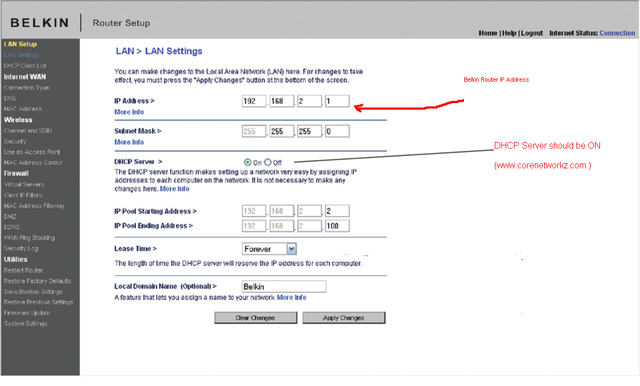 By default Belkin router IP address is 192.168.2.1 but you can change it to any other valid IP address. There are some other points you must care about configuring the device. One of them is to ensure the safety of the wireless network. It is a nice practice to enable MAC address filtering to avoid any unauthorized access to your WiFi network. To learn how to enable the MAC address filter, follow the link below. Some users say they were able to access the Internet before adding a Belkin router in their network. After installing the router, they are not able to go online. There are so many reasons for this issue and we have an article about how to deal with such a situation. If you face such an issue on your network, follow the link below to fix it. It is really nice to hear. i did all these steps but still i am not able to set up a good wireless network.its always limited or no connectivity.not even once i got good wireless connection.plzzz help me.i hv belkin N router. Limited or no connectivity can be due to many reasons. I hope this particular post will help you. Can I setup Belkin Wireless G router using the steps you wrote? I have a wireless G router from Belkin and looking for a help to setup it. im sooo saddend and pissed of at Belkin!! So i wanted to install the wireless for the wii but it wouldnt work, so i called the Wii helpdesk they said call the router ppl..
soo i called belkin helpdesk. The dude said ill email you how to change your channel for the router. BUT ITS NOT WORKING. so i called them back and he said i dont know why itst working. Sooo can anyone help me. If it is not working try following things. If still facing issues ,you should clear browser temporary files. Can I enable WPA2 in Belkin router ? Thanks for your post. Saved me lots of time. very strait forward and right to the point. 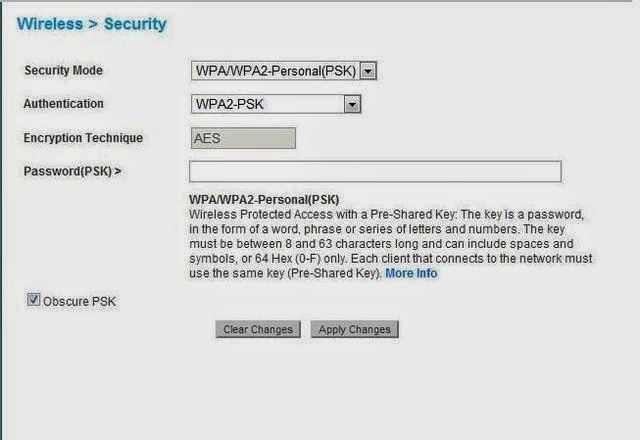 We can use WPA2 wireless encryption in Belkin Wireless router. Can I configure Xbox 360 with Belkin router ? Can you provide me the setup steps ? what happens if i can't log in with my password.....stupid i know! If you forget the login password of your Belkin wireless router, follow the steps mentioned the link below. I have a Belkin N Wireless 75AC57,, model F5D8236-4 v2 router. It was working good until I messed with it to try to add another wireless device (Nintendo DSi xl) and found that I had to change the security settings to do this. I didn't know what I was doing at that time. Now I've figured out what I should have done, but my Belkin Router icon has disappeared. Cannot access the router default reset online webpage because it says the link is broken! Called Belkin helpdesk and that is what happened when they also tried to have me access this web page. I understand there is also a reset button on the router, but I cannot find it. I was told it is probably on the bottom of the router, but the only thing I see there is the plastic stand that holds the router in a vertical stand-up position. I have tried to take the stand off, but it doesn't seem to come off, and I don't want to break that too! Any ideas from anyone? The reset button is on the side that wraps around to the rear where the connections are(oppisite side where "Belkin" is imprinted". It's in the center near the "top" (where the antennas are) Use a paper clip or similar to press it. Can the N Wireless Modem Router support a Vonage VOIP phone? First of all I have 2 Belkin N routers. The reason for this is my house is a little too big for the range of just one in the position where I had to put it - ie at one side of the house. I bought another one to try and set it up as a repeater. The trouble is when plug out my internet cable from the router and I go to try and setup the router my default gateway address in ipconfig is gone. I'm afraid to reset the router completely because it took me ages originally to get just the one router working. Is there a simple way to get these two speaking? You would really be helping me out. I understand from your question that you have 2 Belkin wireless N routers and you want to use the second one as a wireless repeater. The trouble is when plug out my internet cable from the router and I go to try and setup the router my default gateway address in ipconfig is gone." I ju1st brought a Belkin N router, The set up is working prefectly but I also have a Cannon computer that has Wi-Fi so what I want know how do I set up my printer with the router to go wireless? Please Help! If your PC can connect to Belkin wireless network, your router settings are fine. So it is better have a look at the adapter side (of netbook). Have a look at the link below. Instructions were great!!!! AT&T wanted to charge 50 bucks for the same info....such a rip off! And they were the ones who caused the problem in the first place. I'm glad I found your post. I was up and running again wireless in less than 5 minutes! THANKS!!!! This was great after agonizing over how to connect my new laptop for hours I looked this up and within ten minutes had it running. Please follow the link below to troubleshoot the issue. Can I connect linksys Range extender with Belkin router? I made some false settings in my belkin router. Can you tell me how to reset that settings and reconfigure my belkin router ? In order to reset your belkin router follow the link below. 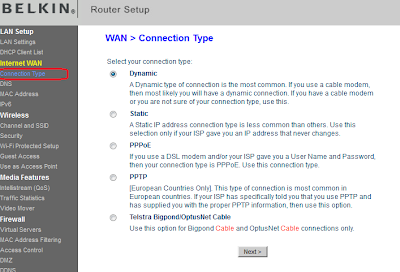 After reset your router, you can setup it again by following the steps mentioned in this article. 129.70kbps. It should be much faster. Are you getting high speed when the Belkin router is removed and computer directly connected to the modem ? after 3 days and calling tech support 4 different times and not being able to connect the belkin router to my modem....i kept getting a message from my computer saying that there was a bad connection unplug and replug ....so i did with a different yellow lan cord and it worked perfectly. the networking cable that was shipped with the router was bad. Its good to know that you found it by yourself. You provided steps to configure this device by accessing the setup page. I do not want to access belkin router. I want to know how to configure it? Belkin wireless N router.. Works perfectly for our laptop, but very poor signal for other wireless devices in the house. my sons ps3, and android cell phones get very poor connections. any help? Make sure there is no compatibility issues with wireless encryption used on Belkin Router and your wireless devices. I recommend you to change the wireless encryption you are using on Belkin Wireless router and check for the issue. I purchased a Belkin model F7D7302 new in the box. I followed all the steps and received a message to call Belkin. When I called they insisted I pay $40 before they would support the product. The thing does not work and appears to be some sort of scam. I recommend that everyone avoid buying this junk. Have you received any error message while configuring your Belkin router? I recommend you to reset your router and reconfigure it. To reset your Belkin router, follow the link below. Has anyone figured out how to rename the router's workgroup to something other than "Workgroup"? Previous "hidden" pages htm don't work. Have piddled around with several variations, and so far, no luck. I don't know where else to post on this POS router (F5D8235-4 v2), but I'm probably going to toss it in the garbage if I can't find a workaround. All I want to do is give the router a PASSWORD other than the default password of BLANK. Sounds easy? Right? When you go to the change password page and type in your new one (remember the old one is blank or empty), it ALWAYS barks back saying "Current Password is invalid"! 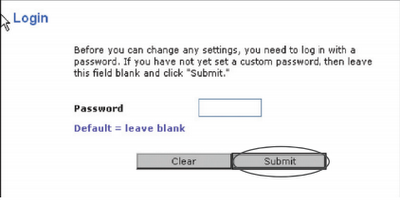 The current password is blank, so an empty input box should suffice, right? I tried other browsers with the same results (FF, IE, Opera). Madness, I tell you. Madness! It seems strange, if you are not able to create a password for your router, I suggest you to follow the steps below. Belkin is not good router, It's insecure and not stable connection. Clik Login, and see the source you will see the password login. So, WPA will be useless. You are really under high risk by using Belkin Router. Updating firmware doesn't solve the big Belkin mistake. I'm sorry but could you please elaborate a little more in regards to the connnection between my modem and the belkin router? As you've said that the LAN port from the modem is connected to the Internet/ADSL port of the Belkin router, however the Internet/ADSL port of the Belkin Router requires a phone line not a LAN cable? You can connect the LAN port of your modem to the WAN/Internet port of Belkin router. If normal Ethernet cable is not not fit for your Belkin router, kindly tell us the model number of the Belkin router you have purchased. 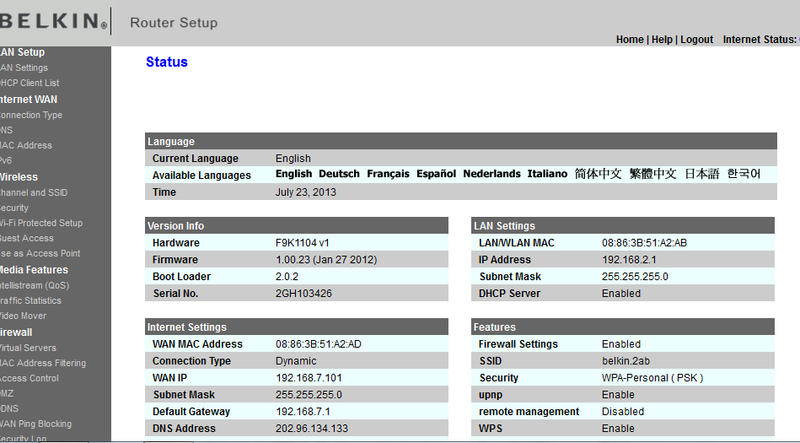 I need your advice concerning with "BELKIN F5D8231-4 V1000 ROUTER" which I use. I wanted update the program (Firmware Update) with V5000 but it automatically cancelled and said that I used wrong update. After that I cant connect to my computer for going to this(192.168.2.1 ) address. Also I tried to push RESET button, but it's also didn't helped. How can I restore the program. After " Firmware Update " it's can't connect to local network and couldn't find it's address (192.168.2.1). I tried RESET but its also didn't help and the routers blue light blink all the time. Also I tried to do 30/30/30 hard reset ( I read it in forums) but again no result. How can I return the program?. The default login IP of BELKIN F5D8231-4 V1000 ROUTER is 192.168.2.1 Even if you are not able to access the router webpage via this IP address, it means you did not reset the router properly. To do proper reset for your Belkin router follow the steps below. 3. Take of your hands from reset button and wait till the light is steady . Do a power cycle for your Belkin router. Belkin Router should accept your Internet connection details without any error if it is in a correct format. If you face issues then follow the steps below. Click on the link for more details about how to reset Belkin router. If still you face the issue, you may update the firmware of your Belkin router. Please make sure that your modem is connected to the Belkin router, not the telephone line directly to the Belkin. Telephone line splitter --- Modem and Telephone. So here you make sure that the correct cable from splitter is going to the Telephone and modem. You can check your Internet Service Provider (DSL) manual for the exact diagram. I have a Belkin N router every thing was fine until I added my blackberry I have now lost all wireless connections what can I do ??? We have a Belkin Wireless Router. The wireless connection was set up using a Mac. Now when friends are here with their PC laptops, they cannot connect to the Wireless yet anyone with a Mac can. Why is that? We have tried both the main wireless password and the guest option... neither will work with PC's. Can you help? Try to change your SSID, Wireless channel and beacon interval. Also make sure there is no MAC filtering is enabled in your Belkin router. Can You tell me how many computers are connected to your Belkin router? Is this connection problem only for your laptop ? Hi was wondering if you know if you are able to connect the belkin router wirelessly to the interent that is already active without having to connect a ethernet cable to the back of it. As i am currently struggling atm. Hi i was wondering if anyone knows if i can connect my Belkin wireless Router N300 wirelessley to the already active internet connection without having to connect an ethernet or adsl cable to the back of the router. As i am wanting to put another router in a different place in the store but just want to extend the connection as the main router is some distance away. To complete your requirement, you may need an Access Point or Wireless Range Extender if you want to connect your Belkin router wirelessly to an active Internet connection. An ordinary router cannot perform wireless cascading. We Consider Belkin Routers are the Best Home Wireless Routers . Belkin router can be setup using just Few simple steps . Internet Connection From Your Internet service Provider Like At&t, Comcast , Verizon Or Any Other Provider . 2- Open the Default Gateway with 192.168.2.1 and Configure The Router As You Like . Hello, your article is very helpful! you have written a good article. thanks for sharing with us your ideas. I have also written an article please visit my page.